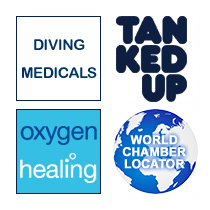 The Midlands Diving Chamber is a member of The Undersea and Hyperbaric Medical Society (UHMS), which has published guidelines on the use of HBO for the above treatments. Hyperbaric Oxygen Therapy is a non-invasive medical treatment which involves breathing 100% oxygen at an increased pressure, through the use of a Hyperbaric Chamber. Breathing 100% oxygen under pressure allows oxygen to dissolve into the blood plasma, when this occurs, increased amounts of oxygen can be delivered to injured tissues. The Chamber located at the Hospital of St. Cross is a large Multi-place chamber which can accommodate up to 10 “divers” at once. A Hyperbaric Chamber, also known as a Diving Chamber, is best described as a “pressurised room”.